The other day while unpacking boxes I found the user manual for my bread machine.I hadnt used the thing in forever so I decided to skim it quickly. I then discovered I could use it to make BAGELS!!! Im addicted to bagels. When I was pregnant I ate one every morning to keep the morning sickness away. Buying bagels can be pricey. Bagels at the grocery store are 69 cents... and Panara (maker of my favorite bagels) gets a whopping 89 cents a bagel. So I decided to try and make a batch. They turned out great! They are smaller than your mammoth store bought bagel but that just means less calories to burn. 3. When done remove from machine. Punch down and set in a bowl to rest for 10 minutes. Cover with towel. 7. 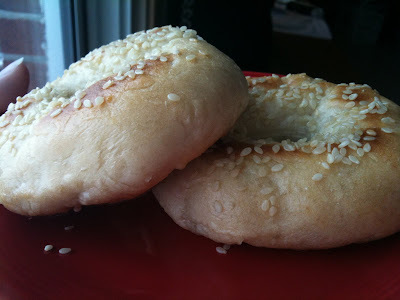 After the 20 minute rise place bagels under the broiler on high. Broil 2 minutes, flip bagels over broil 2 more minutes. 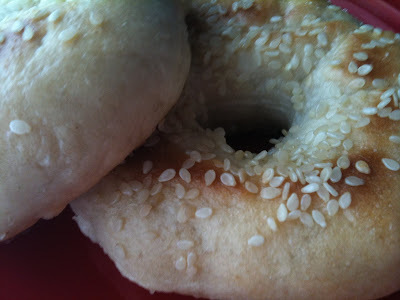 I love the idea of using the bread machine to make these bagels. Thanks for the recipe.